The WAND Wholesale Taxonomy provides 458 terms and 589 synonyms. Included are the Types of Wholesalers, Inventory Management, Wholesale Trade Sectors, Financial Operations, Fulfillment, Documents, and Value Added Services. Other top level terms are Events, Metrics, Policies and Procedures, Regulations, as well as Trade Groups and Organizations. 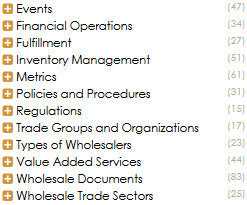 The WAND Wholesale Taxonomy can be customized to meet the needs of any business in the wholesale industry. Complementing the WAND Wholesale Taxonomy is the WAND Retail Taxonomy. As with all WAND Taxonomies, the WAND Wholesale Taxonomy is available by itself or as part of the WAND Taxonomy Library Portal. Metadata is the foundation of quality enterprise content management. Wondering how to get started with Managed Metadata in SharePoint? WAND has a free General Business Taxonomy download for users of SharePoint. This taxonomy imports directly into the term store and includes concepts for HR, Sales and Marketing, IT, Legal, and Accounting and Finance. It's a great way to get taxonomy content that can allow you to begin to test out the SharePoint managed metadata capabilities and show the value in your organization.